Thanks for the offer, Saul! Appreciated... I will first check with Thomann on Monday, if they have any update for me. If not, I will come back to you. So I asked on Monday. By "coincidence" Yamaha actually had the repair finished on Monday. Now I have it back. No undue key noises anymore and everything works as expected. It's really nice to be able to play with headphones and not hear the clacking of the keys when releasing them under the headphones . Thanks anyway for your offer, Saul! 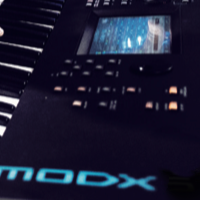 Thanks for the update and very glad to hear that you now have a fully functional MODX8. It should definitely not have taken so long to repair though....actually it should not have needed repair this early on! If it happens again I think you could very reasonably ask for a replacement not a repair. New post White-Faced Oberheim Matrix 1000, anyone here owns one?